Weight loss can become easier with the help of this Original Hypnotic Gastric Band Audio. Benjamin Bonetti is one of the world's best-selling hypnotherapists. His advanced hypnotic technique sends positive messages to your subconscious so you can accomplish your goals. See a healthier happier you, living the life you deserve. Produce amazing weight loss results with this hypnotic gastric band. Cut your food intake with reduced cravings. 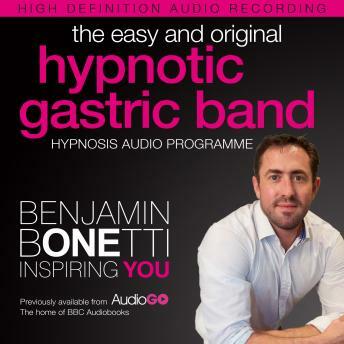 Benefit from a deep relaxed state with the original hypnotic gastric band. This hypnotic recording will install powerful affirmations through visualizations that will encourage change to happen naturally. The hypnotic gastric band is a pain-free, completely natural healthy eating tool that can help control your appetite and your portion sizes. Simply adjust it to suit you, feel the difference and watch the pounds drop off. Note: This Hypnotic Gastric Band is not suitable for under 18s. Do not use if you suffer from epilepsy, clinical depression, or any other nervous or psychiatric conditions, or whilst driving, exercising, operating machinery, taking alcohol or drugs. If in doubt, seek medical advice. The product's effectiveness is not guaranteed. No liability is accepted for any lack of effectiveness. Your statutory rights are not affected.